Naim's new SuperUniti network music system: it's like a UnitiQute, but louder! | What Hi-Fi? Naim's new SuperUniti network music system: it's like a UnitiQute, but louder! Naim is adding a SuperUniti to its streaming products line-up, slotting into the range above the existing NaimUniti and UnitiQute. The new model – announced today at the first of Naim's Summer Sounds: On Stream roadshows – combines the facilities of the company's UnitiQute, Naim DAC and SuperNait integrated amplifier. With an 80Wpc output, and selling for £3250 when it hits the shops early in October, the company says the SuperUniti 'extends the Uniti range and the possibilities for UnitiSystem into the high end'. It features a latest-generation streaming board: this digital six-layer design gives the SuperUniti the ability to stream 192kHz/24-bit content, Naim describing this as 'the first of its 24/192 products'. As well as Wi-Fi and Ethernet inputs, the SuperUniti also has two electrical and three optical digital inputs, three line analogue inputs, preamp output and stereo subwoofer output on its rear panel. Meanwhile the front panel has 3.5mm sockets for stereo line/optical in and headphone out, plus a USB socket. In common with other UnitiSystem products, the SuperUniti can accept a direct digital input from iPods, iPhones and iPads via the USB socket, and can also be controlled over a network by an iOS device running the company's n-Stream app. In addition the SuperUniti has both DAB and FM radio tuners, plus of course access to thousands of internet radio streams. Digital filtering is handled by a SHARC DSP chip running proprietary Naim code, and the SuperUniti uses Burr-Brown PCM1791A conversion, as also used in the NDX and HDX. Completely new for the SuperUniti is a high-performance digitally-controlled analogue volume adjustment, using discrete resistors and high-performance electronic switching to give what Naim says is the sound quality of an analogue volume control with the flexibility of digital control. 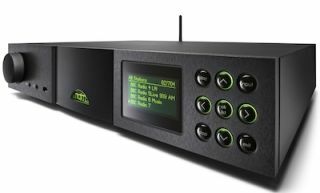 Naim has also announced a free of charge update for the HDX (above), UnitiServe and its NaimNet music servers: it adds internet radio capability to these devices, and will be available from Naim retailers at the end of this month, either as a dealer upgrade or as a disc for owners to upgrade their own unit.